You guys. 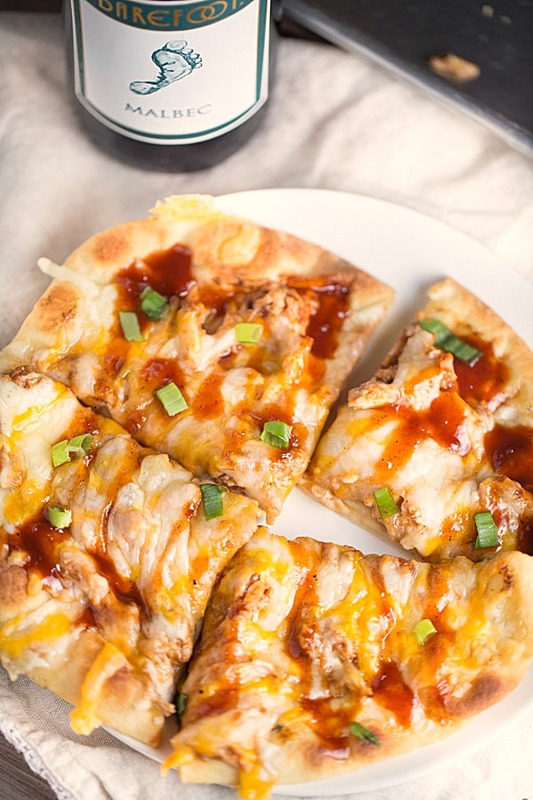 This BBQ Chicken Naan Pizza is SO good. And the homemade Malbec BBQ Sauce, I could drink it straight from the jar. I’ve teamed up with Barefoot Wine to bring you delicious, budget friendly recipes that are easy to make. 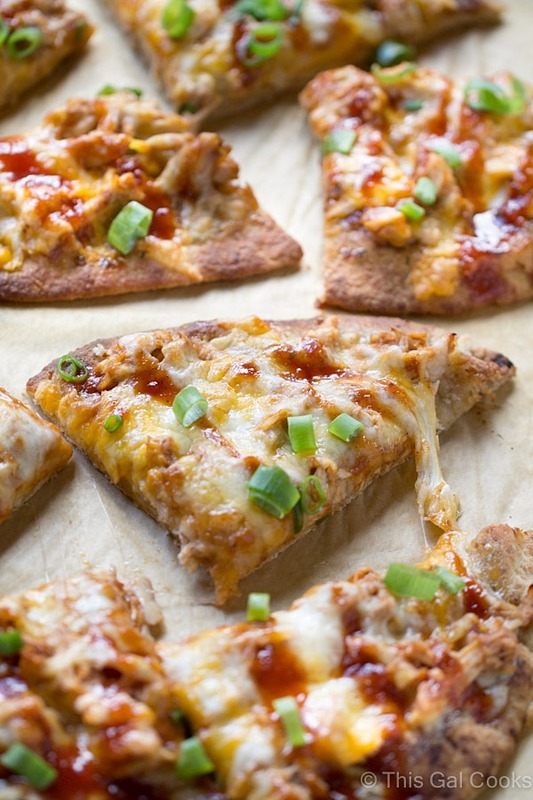 Today I’m sharing this BBQ Chicken Naan Pizza with Malbec BBQ Sauce. 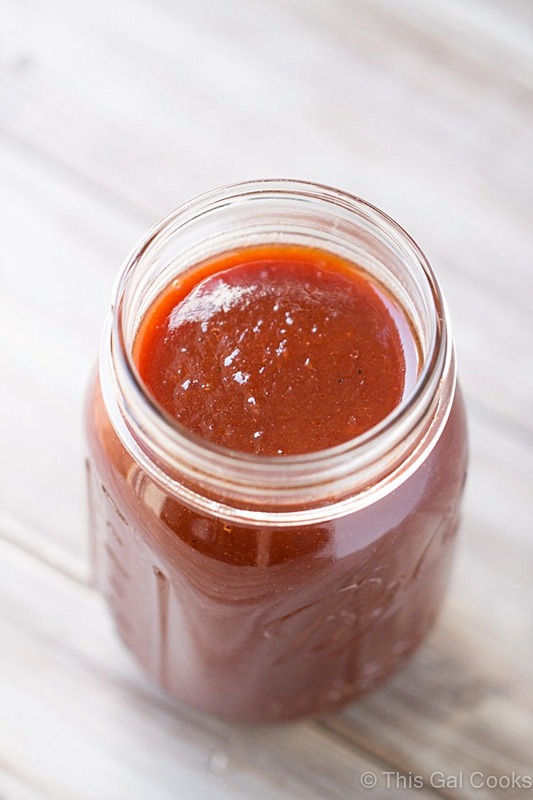 I made the sweet and spicy BBQ sauce with Malbec from Barefoot Wine. This recipe will easily feed a family of four. Pair it with a light salad and a glass of Malbec for the adults at the table. Ken and I actually devoured BOTH of these pizzas by ourselves. They were gone within 20 minutes of me setting them in front of us at the coffee table. 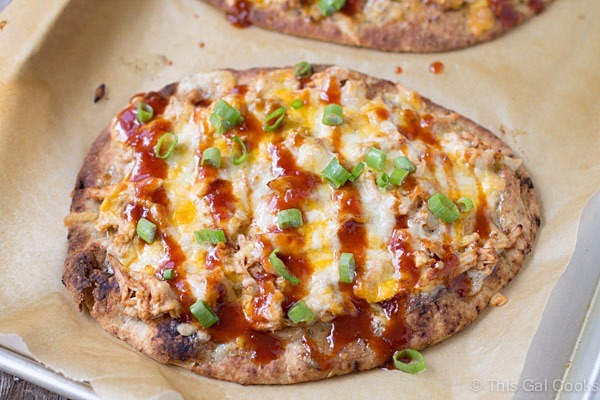 The soft, pillowy naan crust topped with creamy ranch dressing, tender shredded chicken, sweet and spicy BBQ sauce and gooey cheese was simply irresistible. You’ll start of making the Malbec BBQ Sauce. I made the sauce the day before I made the pizzas. I wanted to give the flavors of the sauce time to mingle together. It was totally worth it. The sauce tasted even better the next day. If you don’t have time to make the sauce the day before, it’s quite alright to make it the same day you make the pizza. Once your sauce is ready, you’re ready to make the pizza. Place two pieces of naan on a baking sheet. Top with ranch dressing, shredded chicken and cheese. Bake for 8 to 10 minutes then drizzle with BBQ sauce and sprinkle with sliced green onion. BOOM. You have great pizza that the entire family will love. ½ tsp liquid smoke (optional - I did not use this but if you want to add smokey flavor to your sauce, add some liquid smoke). Place all of the sauce ingredients in a large sauce pan and mix well. Bring to a boil. Stir and reduce heat to a simmer and simmer for 20 minutes or until slightly thickened. After simmering, puree with an immersion blender. I did this to blend the onions into the sauce. Mix the shredded chicken with 3 tbsp of Malbec BBQ sauce. Line a large baking sheet with parchment paper. Place the naan on the baking sheet. Spread the ranch dressing over each piece of naan. Divide the shredded chicken and then sprinkle over each piece of naan (3/4 C each). Top each of the pizzas with the shredded cheese (1/2 C each). Bake at 350 for 8 minutes. After baking, turn on the broiler and broil until the cheese is slightly browned. Remove the pizzas from the oven and drizzle with the Malbec BBQ sauce. Sprinkle the pizzas with the sliced green onion. Cut each pizza into four wedges. This looks so good! That BBQ sauce sounds amazing!!! OMG! I’m all over this recipe! 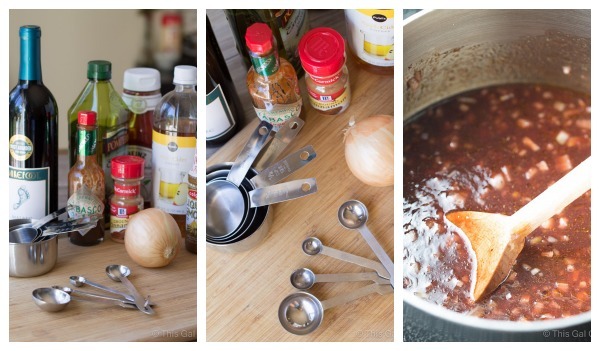 It sounds amazing, and that sauce….YUM! I love naan pizzas because they are so quick and easy. 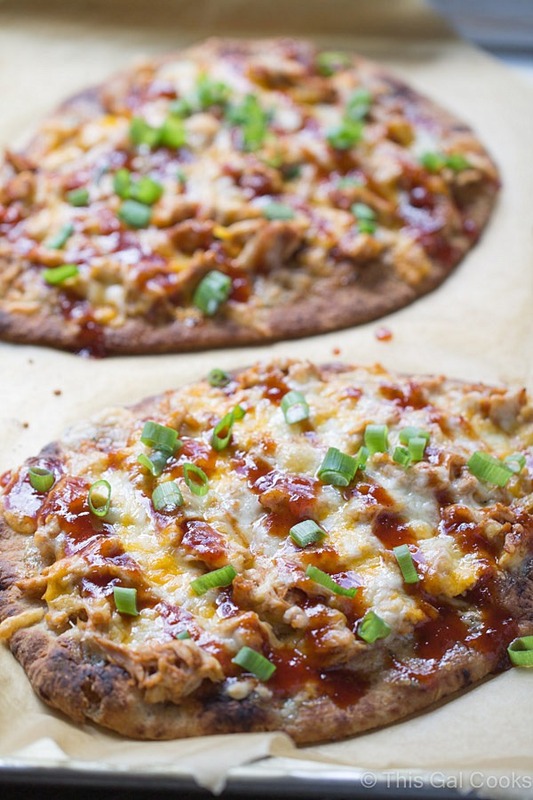 The flavors in this bbq chicken pizza with the Barefoot wine sounds delicious! I wish this was my lunch today! I think I’m hooked on the naan pizzas. I made breakfast pizzas with it over the weekend. So good! I want every last crumb of this and I’ll take the Malbec too! Wow. Looks crazy good! Ahhhh this is just pure bliss!! Love the flat naan that you used here and I need that BBQ sauce! This looks so good! I had a frozen bbq chicken pizza last night but this looks a million times better! Holy pizza!! That looks INSANE! That second picture has my mouth watering. I love this creative use of wine. Malbec is one of my favorite reds – I’d drink both the wine and the BBQ straight from the bottle! Looks divine! If you guys are anything like we are, they will be gone in 10 minutes flat! Thanks so much for stopping by, Gloria! BBQ sauce made of wine, yes count me in! This looks crazy good. I can’t wait to try this. Bookmarking it, so I have it for later. Thank you, Victoria! I hope you enjoy the recipe! Uhhh yeah, this looks amazing!!! 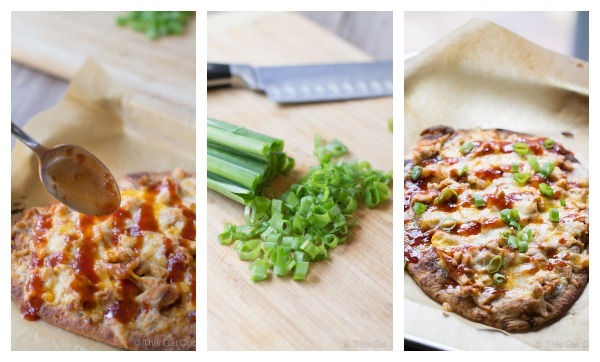 Bbq pizza is my favorite, and I love the idea of using naan instead of pizza dough…so simple! Thanks, Karishma! We love BBQ Pizza, too! Speaking of naan, I had some in my pantry over the weekend so I decided to make breakfast pizzas with it. WIN! This pizza looks amazing! Love that you used the Barefoot wine in the bbq sauce, I can just imagine how flavorful it is! Can’t wait to make this for pizza night at our house! Pinning! Malbec BBQ Sauce?! oh my gawd, sounds fabulous!!! I love Malbec wine so can’t wait to try this! A barbecue sauce made from wine? I don’t think you can go wrong with that. This pizza looks delicious and your photos are beautiful Julie! Inspiration pizza station – Yesterday we made these with regular dough and BBQ sauce as the base (since Ranch is nowhere to be found in Holland). Success! We ate them in silence and they were gone in 5 minutes flat. Oh yay! So happy you enjoyed the pizzas! LOVE the idea of using BBQ sauce as the base, too! This pizza looks unbelievable!!! I can’t wait to try it! I am DROOLING! 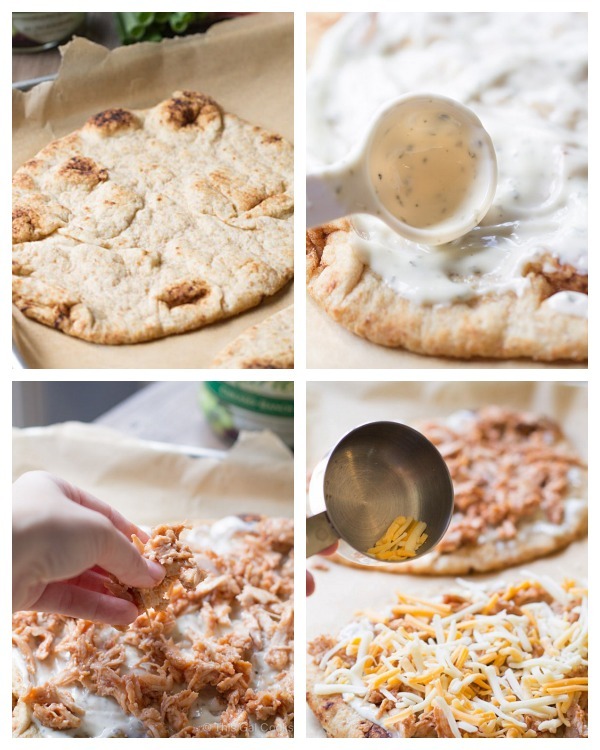 These naan pizzas look so cheesy and that sauce…yummy! I’m making these with leftover turkey! Thank you, Bri! Great idea to make them with leftover turkey! This was truly amazing. We loved it. I did have a question about the sauce though. Can you freeze it? There is a lot left over. I so don’t want to get rid of it. Thank you so much for this awesome recipe. I wouldn’t change a thing about it. Hi Darlene! Thank you so much for stopping by to let me know you enjoyed the recipe. I truly appreciate it. I did not try freezing the sauce as we just used it on other things and even made these pizzas again. But I did find some info on freezing BBQ sauce and you can freeze it for up to 3 months. Here is the info, from The Kitchn, in case you want to check it out. Hope this helps! Thank you so much. I didn’t even think of using it on other things. I think I’ll use it on chicken tonight. I will check the link as well.